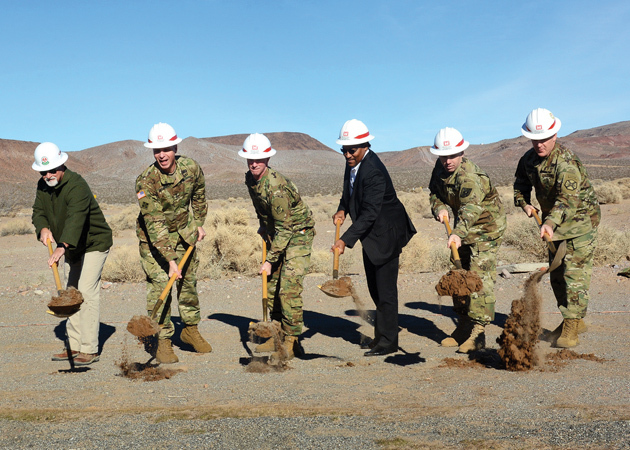 Ceremonial shoveling at the ground breaking (left to right): Todd Gillum, president of Cox Construction; Maj. Gen. Joseph Martin, commander of the National Training Center and Fort Irwin; Col. Kirk Gibbs, commander of the Los Angeles District, U.S. Army Corps of Engineers; Marcus Watkins, NASA management office; Col. Matthew Ruedi, commander of 916th Support Brigade, and Col. Scott Taylor, commander of United States Army Garrison at Fort Irwin. The National Training Center and Fort Irwin conducted a ground breaking ceremony for a facility that will support a unit that operates Army unmanned aircraft systems, Jan. 12. The complex will provide a headquarters for B Company, 229th Aviation Regiment, and house a fleet of 12 MQ-1C Gray Eagle unmanned aircraft. The unit known as the “Flying Tigers” has operated Gray Eagles since it was re-activated here Oct. 16, 2014. The unit is currently deployed. 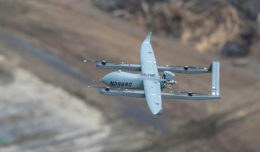 After being reestablished, Soldiers of the unit began their training and flying Gray Eagles from temporary structures located in a remote area of the Goldstone NASA complex, a neighbor of the NTC in the Mojave Desert. Within a year, the Flying Tigers were ready to deploy for real-world missions and supporting combatant commanders. 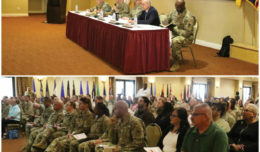 “They are there doing what they’re doing with the training that was built on a foundation that was built right here with this temporary facility,” Martin said. 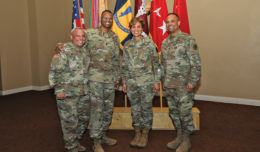 The new facility will include a 52,000 square-foot hangar, repair shops, company administration offices, aircraft container storage and vehicle parking, stated Col. Kirk Gibbs, commander of the Los Angeles District, U.S. Army Corps of Engineers. His office is providing project management. The site is scheduled to be completed by the fall of 2017.